A couple of weeks ago, I tried this DELICIOUS slow cooker butternut squash sauce from Mel's Kitchen Cafe. I was going to try it over quinoa, but it was indeed on the saucy side and went better with pasta. 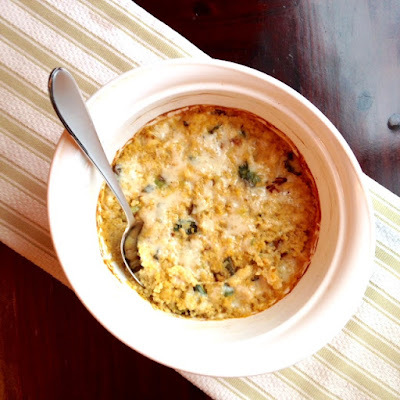 I still wanted to utilize my quinoa, so I took the leftovers (there were PLENTY, even though I halved the recipe) and put together a quinoa bake that I thought I'd share. It would be a perfect side dish for the holidays, or a nice vegetarian main course - 'cuz quinoa is a complete protein, don'tcha know. Making the sauce from scratch in the slow cooker and THEN the bake might be a bit time consuming, but I think that picking up a store bought container of butternut squash soup and melting a little bit of cream cheese into it would work just as well. 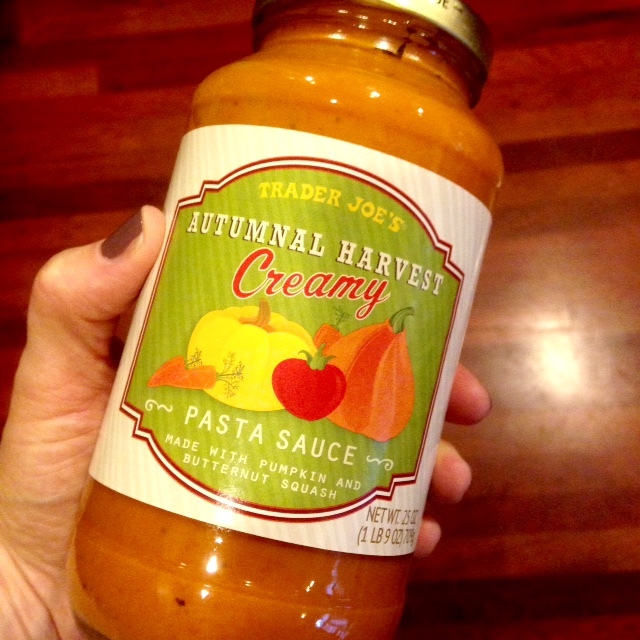 OR you could use this fantastic Trader Joe's pasta sauce for a pumpkin version! Saute 1/4 cup of diced onion and a tablespoon of olive oil in a skillet until soft. Add one clove of chopped garlic and 1/4 teaspoon each of: dried rosemary, sage, thyme, salt and pepper and cook for one minute. Pour mixture into slow cooker with one pound of cubed butternut squash and 2 cups of chicken stock. Cook on low for 8 hours or on high for 4 hours. Blend with an immersion blender until smooth and whisk in 4 ounces of cream cheese. Preheat oven to 375 degrees and prepare a cookie sheet lined with foil. While the quinoa is cooking, toss the cut brussels sprouts with a little olive oil, salt and pepper and roast in the oven for about 20 minutes, tossing half way through. Once the sprouts and quinoa are cooked, mix them with the sauce and 3/4 cups of the Gruyere in a large bowl and then spread into 9x11 pan, or favorite casserole dish coated with cooking spray. Top with remaining shredded cheese. Bake for 25-30 minutes, until bubbly and the edges turn golden brown. I'm thinking this might be our post Thanksgiving dinner, complete with leftovers!